Choose from 73 hotels and guest houses in Antrim. Shown below a just a selection of the hotels available. To search within an area please use the menu on the right. A place of cutting-edge modernity with the finest traditional values, Corr's Corner Hotel has held a special place in community since 1919. 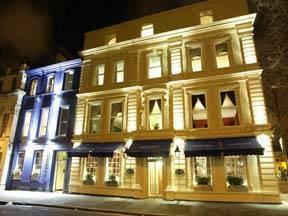 The newly redeveloped hotel with free Wi-Fi and free parking was voted 'Hospitality Venue of the Year 2008.' It is 7 miles (11.3 km) from Belfast city centre, and at the gateway to the breathtaking Causeway Costal Route. Friendly and helpful staff will welcome you, and inside the hotel you will find bustling bars and restaurants with a lively mix of locals and international visitors. An extensive ? la carte menu is served all day, every day. Corr's Corner Hotel is one of the largest conference venues in the North, offering 9 conference suites, for up to 250 delegates. 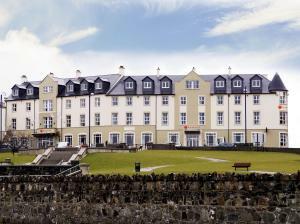 The Port is a quaint hotel located on Main Street in Portrush. It is family-run and has a welcoming, traditional atmosphere. 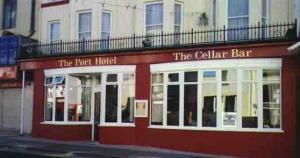 The Port Hotel has a busy bar and hosts regular entertainment evenings that are popular with locals and tourists. The en suite B&B accommodation is close to shops, restaurants, amusements, the harbour and top golf courses. This chic, boutique Victorian town house has warm Irish hospitality and modern luxuries in the peaceful Queen's Quarter of South Belfast, minutes from the city centre. At the award-winning Malone Lodge Hotel with apartments you will find a gym, a sauna, and Green Door restaurant with an AA Rosette. The property has luxury hotel rooms and 23 five-star self-catering apartments with 1, 2 or 3 spacious bedrooms. Malone Lodge also has a private car park and banqueting facilities for up to 130 guests. Recent awards include: Go Belfast' Hotel of the Year; Northern Ireland Wedding Venue of the Year; and Northern Ireland Tourist Board Highly Commended Hotel of the Year. This elegant and intimate hotel offers superb accommodation at a very smart price. The Crescent Townhouse has an informal but gracious atmosphere that brings delighted guests back time after time. Behind the Crescent Townhouse's striking 19th century listed facade can also be found the street level cosmopolitan Metro Brasserie with its wine bar ambience and the welcoming traditional Bar Twelve. The Crescent Townhouse earns bonus points though for its unrivalled location. It may be discreetly tucked away, insulated from sight and sound of the bustling Botanic Avenue milieu, but step outside and you are on the doorstep of the best of South Belfast's night life and entertainment. Just 5 minutes away from Giant's Causeway, this purpose built lodge provides the ideal base from which to explore the natural beauty of North Antrim's coastline. Personally run by the owners, Lyle and Ann Taggart, Causeway Lodge has been approved by the Northern Ireland Tourist Board. 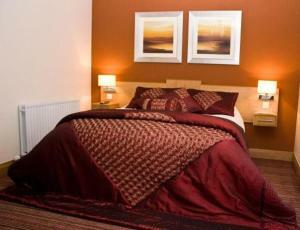 With just 4 comfortable en suite rooms you can be assured of personal service and a cosy, relaxing atmosphere. Occupying a peaceful rural setting just a short distance away from the Causeway Coastal Route and Whitepark Bay, Causeway Lodge enjoys wonderful views towards the picturesque Causeway Headland. 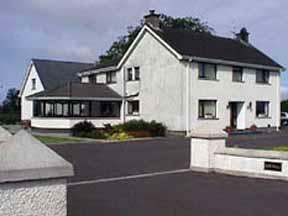 Keef Halla is the nearest award winning 4 star guesthouse to Belfast International Airport. 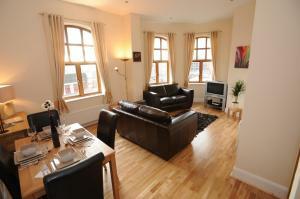 Keef Halla is the place to stay around Belfast, for either business of pleasure . All seven en-suite bedrooms are elegantly decorated with satellite tv, direct dial telephone, trouser press, tea and coffee making facilities and refreshments. There is free wireless Internet access to all areas of the guesthouse, and there is lots of free off road car parking available. Golflinks Hotel is situated in the heart of the North Antrim Coast directly across the road from the famous Royal Portrush Championship Golf Course. With 18 ensuite recently refurbished bed rooms with full hotel ammenities we are the ideal location for business or pleasure. The hotel incorporates Beetles Bistro which serves fresh local produce daily at competitive prices. At the back of the hotel you will find the famous entertainment complex offering live bands, DJ's & family entertainment. Situated just 15 minutes walk from the Odyssey Arena, this 5-star city centre hotel is located in the stylish Laganside riverfront area, only 5 minutes walk from the shopping areas. 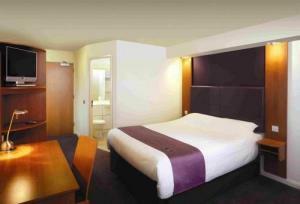 Hilton Belfast offers all the facilities and services that you would expect from a Hilton hotel. It also offers a prime central location, within easy walking distance of Belfast's main shopping area and its vibrant night life. It is situated next to Waterfront Hall conference and exhibition centre, so is ideal if you are attending an event there. A 5 minute stroll will take you into the city centre, where you can experience all that this vibrant city has to offer. Soak up river views from the hotel's Sonoma Restaurant or enjoy a cocktail in Cables Bar. Executive room guests also enjoy executive lounge access with free continental breakfast. 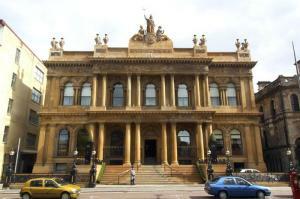 Located in the city centre, this hotel is adjacent to the Grand Opera House and Belfast City Hall, a few minutes' walk from Victoria Square, Castlecourt Shopping Centre and Dongell Place. 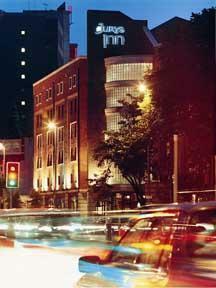 The hotel is also walking distance from Waterfront Hall, a choice of restaurants, pubs and bars. The hotel offers an excellent standard of 3-star accommodation and rooms can accommodate up to 2 adults and 2 children, or 3 adults or one person in complete comfort. The hotel also boasts Innfusion Restaurant, serving international cuisine at reasonable prices, and Inntro Bar which serves excellent bar food. Set in 220 acres of the Castle Upton estate in County Antrim, this hotel and country club offers a range of facilities that will find favour with the active and relaxed alike. The hotel's 18-hole championship golf course meanders for over 7000 yards and will test the abilities of even the finest golfer. 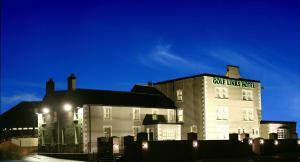 The hotel is 20 minutes' drive from Belfast city centre, and Giants Causeway is 40 miles away. In the heart of Belfast's city centre, these stylish and modern apartments offer plenty of space and great value, with free Wi-Fi and free private on-site parking. Corporate Apartments are close to all that the city has to offer, including shops, museums and art galleries, as well as cinemas, pubs, bars and restaurants. Each individually styled, contemporary apartment provides a sophisticated setting with all the comforts of home. Open-plan in design and offering living space up to 4 times that of a standard hotel room, the apartments are an excellent alternative to traditional hotel accommodation. Each apartment has a sleek, well-equipped kitchen/diner and a lounge area with the latest audiovisual entertainment: flat-screen TVs, DVD players and stereos. Please see 'Important Information' below for information on key-collection. With a superb location, in Belfast's Cathedral Quarter, right in the heart of the city centre, the hotel offers great-value, with comfortable, spacious and modern en suite rooms with Freeview TV. The Premier Inn Belfast City Centre Waring Street is within easy walking distance of all that Belfast has to offer, including shops, bars, restaurants and museums, as well as the city's public transport network. The hotel has a 24-hour reception desk and some rooms can take 2 adults and up to 2 children (under 16 years). The 2 children also get a free full breakfast when accompanied by an adult eating a full breakfast. An all-you-can-eat buffet breakfast is available each morning and includes scrambled, fried, poached or boiled eggs, and pork or vegetarian sausages. There is also a wide continental selection. The on-site Four Corners Bar and Restaurant offers good food and drink at reasonable prices. In the centre of Belfast's lively University Quarter, this good-value 3-star hotel is within 2 minutes of the many restaurants, bars and cafes of popular Botanic Avenue. The Express by Holiday Inn offers great rates including a traditional cooked buffet breakfast, free car parking and free Wi-Fi in all public areas. Children under 12 years can stay for free when with a paying adult. Express by Holiday Inn is within walking distance of the historic Queens University, as well as major tourist attractions such as Ulster Museum and the Botanical Gardens. Great Victoria Street bus and railway station can be reached in 5 minutes. In a stunning new development, these stylish and contemporary apartments offer free Wi-Fi, free parking, 32-inch LCD flat-screen TVs, DVD players and fully equipped modern kitchens. 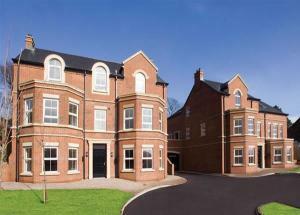 Located in a suburban location, just a few miles from Belfast's city centre, Glebe House is a development of luxury town houses and apartments. The convenient location offers good access to the city and the region's major transport routes, including the M2 and M5 motorways. The development is only a few minutes' walk from Glengormley village, which offers a host of amenities, including bars, restaurants, a cinema and a bowling alley. One- and two-bedroom apartments are available, all fully equipped with brand new appliances and furnished to the highest standards. With all the freedom, independence and convenience of an apartment, Glebe House offers a great-value alternative to a traditional hotel. Right in the heart of Belfast's city centre, just a few streets away from Belfast City Hall, this modern hotel offers great value, with spacious, modern en suite rooms with Freeview TV. The Premier Inn Belfast City Centre (Alfred Street) has a superb central location, close to all that the city has to offer, including bars, restaurants and attractions. The hotel has a 24-hour reception desk and some rooms can take 2 adults and up to 2 children (under 16 years). The 2 children also get a free full breakfast when accompanied by an adult eating a full breakfast. An all-you-can-eat buffet breakfast is available each morning and includes scrambled, fried, poached or boiled eggs, and pork or vegetarian sausages. There is also a wide continental selection. The on-site restaurant offers good food and drink at reasonable prices. There is an NCP public car park on site, offering secure underground parking at an additional cost.